Do not use on patients with a history of sensitivity to gel or any of its components. Do not use on third degree burns. For topical use only. For single use only. Wounds that show signs of infection maybe dressed with SupraCel™ under the supervision of a medical physician or specialist nurse in conjunction with a systemic antibiotic treatment program. Do not use if sterile pouch is opened or damaged. Keep out of the reach of children. SupraCel™ is suitable for application and management of many different types of wound including: leg ulcers, pressure sores, surgical wounds, exuding sloughy or necrotic wounds and first & second degree burns. SupraCel™ is a flat sheet wound care hydrogel with a breathable adhesive dressing, available in three sizes, in a sterile pouch format – FD-1143 50mm x 50mm (2” x 2”) flat sheet hydrogel with adhesive dressing – FD-1141 100mm x 100mm (4” x 4”) flat sheet hydrogel with adhesive dressing – FD-1151 (200mm x 75mm – 8” x 3”) flat sheet hydrogel with adhesive dressing. SupraCel™ is a cross linked sterile hydrogel containing propylene glycol, cross linked within a solid polymer matrix. Simple to use in a two stage peel back method, the translucent flat sheet remains visible through the clear breathable film dressing at all times, therefore minimising the frequency of dressing removal for wound site inspection. Depending on wound conditions, SupraCel™ Sheet dressing has the ability to absorb exudate from wounds which are light to heavy exuding whilst maintaining an excellent moisture balance. Due to its fully cross linked nature, there will no maceration of the skin surrounding the wound. The flat sheet SupraCel™ retains its shape and integrity throughout its use. There are no known contraindications to the use of SupraCel™ as a topical wound dressing. 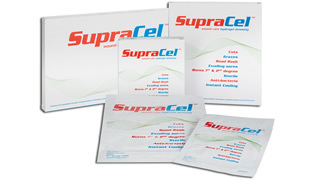 SupraCel™ is supplied sterile in an individual foil pouch. Use only if protective pouch is not opened, damaged or broken. DMC Medical Limited is ISO 13485:2003 + AC:2007 approved. Method of use: SupraCel™ is simple to apply and is supplied sterile in a sealed foil pouch. – The wound should be cleaned prior to application. – Peel back side #1 and place on the wound. Once in place peel back side #2 and secure to surrounding area. Wound maintenance: The frequency of change will be dependent on the ongoing condition of the wound – Depending on the amount of exudate SupraCel™ hydrogel may be left undisturbed on the wound for up to 7-days due to its ability to maintain a moisture balanced environment – Heavily exuding wounds may require changing more frequently due to the amount of exudate absorbed and the prevailing wound condition – SupraCel™ should be changed if leakage occurs around the adhesive dressing – The dressing may be removed at any time without adhesion to the wound surface – SupraGel™ has a bacteriostatic action, which inhibits bacterial growth – Dressing will not allow “strike through” to the back of the pad.